Cebu is the traveler's fantasy of a tropical island come true – wonderful weather, pleasant beaches, crystalline waters, and luxurious resorts with all the frills of modern living. The island of Cebu is where the Portuguese navigator Ferdinand Magellan planted the Cross of Christianity in the name of Spain in 1521. But even before Cebu became the Occidental gateway to the Orient, it was already a popular entry point among Asian merchants. Another noticeable proof is the growing number of tourists in the province, enjoying every minute of their vacation on the island. Cebu is known for so many things --the food, the churches, the guitars, the nightlife, and so many more. From the international airport on the island of Mactan, every tourist and resident will cross the majestic bridges, named Mactan and Marcelo Fernan, which connect to the main island of Cebu. A must-see in Cebu is Magellan's Cross, the original cross that Portuguese Ferdinand Magellan planted during his expedition to the island. Beside it is the Sto. Nino church, which houses the old relic of Sto. Nino, which is said to be the original one given by the Spaniards to the Cebuana queen, Rajah Juana. Another eye-catching view is the road to TOPS, where the entire metropolitan area of Cebu, including the city of Lapu-Lapu and Mandaue can also be seen. Apart from the historical spots, Cebu is also a booming city, with its outsized malls, beautiful hotels, enticing resorts, and colorful jeepneys. Another feature that makes this city a place to visit is the warm welcome of the Cebuano people. This work of art is located in the wealthy residential community of Beverly Hills about 6 km north of downtown Cebu. This temple is said to be preserving the teachings of Lao-Tse, the 600 B.C. Chinese philosopher. A soaring, multi-tiered, multi-hued attraction accessible by three separate winding routes. Attractions here consist of a huge colorful dragon, a replica of the Great Wall of China, spacious balconies offering scenic views, souvenir shops, mini library with instructional materials, and dozens of escalating steps. 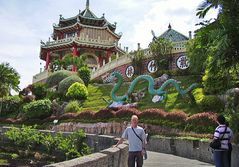 As you visit Cebu, review your checklist of the places to see, and make sure you don't miss going to the higher part of the city, where the astonishing architecture of Taoist Temple can be found. It was built by Cebu’s substantial Chinese community, incidentally making up about 15% of Cebu’s population. Everyday people climb its 99 steps to light joss sticks and have their fortune read. Taoist architecture includes a number of structures according to its functions, categorized as palace for oblation and sacrifice, altar for praying and offering, cubby for religious service, and garden for visitors. The temple is the center of worship for Taoism, the religion which follows the teachings of the ancient Chinese philosopher, Lao Tze. You can see Taoist devotees following their rituals on Wednesdays and Sundays, as they climb the 99 steps of the temple to light joss sticks and have their fortunes read by the monks. The temple has an elevation of 300 meters above sea level, and if you climb the 99 steps to the entrance, you will be rewarded with a good view of Cebu City and in the distance Mactan and Bohol islands. Nice sunset views too. The Cebuano’s Chinese heritage is very visible indeed and one apparent evidence of that is the City’s Taoist Temple, one of the most visited tourist spots in Cebu. Visit Taoist temple and experience the brilliance of it.